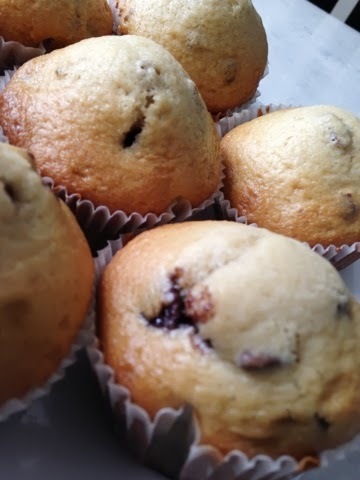 What’s better than freshly homemade chocolate chip muffins [from scratch] for breakfast? Ones with pecans in it for crunch. Typically I pair chocolate chip with walnuts a lot, but the pecan today… love it! I don’t normally cook with oil, and thought about eliminating it or using a substitute… but for today didn’t do so because I know my picky older brother wouldn’t eat it then. Next time, however, I’ll definitely try either a banana or applesauce [which I didn’t have on hand today]. Preheat your oven to 375 degrees. Line your muffin pan with 12 liners. In a bowl, combine your flour, both types of sugar, baking soda, baking powder and salt. Add in the oil, milk and egg. Mix until your mixture is nice and smooth. Fill you muffin pan liners up about 2/3rd of the way. They will rise! Bake in your preheated oven for about 18 minutes. After filling up the twelve liners, I had some extra batter left over. Enough for about 1 muffin or a little more. With it, I experimented with a “mug muffin” in a microwave — put the batter in a mug [about 1/3 of the way up], put it in the microwave [and covered it] for a minute. The result was pretty cool!